When JIRA has a large number of users, projects and issues, using the built in web services can be slow to load. Using the Ecliptic Technologies optimized browsing plugin for JIRA will provide much faster performance for browsing projects and issues in The Connector. 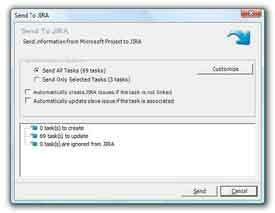 An option on the configuration screen has been added to allow you to populate the Microsoft Project Task Hyperlink field with a link to the JIRA issue. Now, from the project task list, you can click the hyperlink and go directly to JIRA to view details about the issue. An option has been added to the configuration for caching the project list. Once the project list is loaded, it will be retrieved from memory each time you browse projects. This speeds up the user experience by eliminating the delay time of the round trip to JIRA. Resources from JIRA can now use a number of different options when importing and syncing between JIRA. 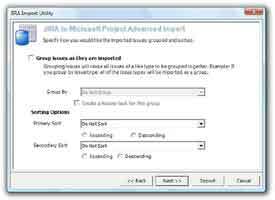 The resource name in Microsoft Project can be the JIRA username or JIRA full name. 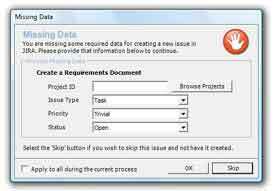 An option has also been added to only assign a user if it exists in Microsoft Project. This will prevent unwanted resource entries from being created on your resource sheet. Support for additional JIRA fields have been added including Project ID, Environment, Components, Affects Versions, Fix Versions and Reporter. This information can now be edited through Microsoft Project and synced with JIRA. Version 1.0 of The Connector would allow only a single JIRA project to be used with each project plan. This restriction has been removed and now you can have tasks that are linked to issues in multiple JIRA projects. The import functionality is being improved to allow more flexibility for filtering the JIRA issues that are imported. You will be able to restrict by issue types, priorities, status and assigned/unassigned. Example: You will be able import all unassigned high priority bugs into your project plan or all open in-progress tasks. The Project Browser and Issue Browser service calls has been placed on a background thread so the user interface no longer locks up when making long queries to JIRA. Also, long queries can be cancelled if needed. A new option has been added to the toolbar for a ?Project Plan? dialog. This will give general information about the project plan such as the total number of issues, number of unassigned or uncreated issues, etc. It also provides a place to put a general comment about the project plan and a way to modify the initialization settings of a plan once it has been created. 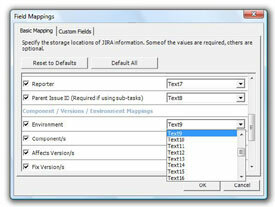 The Issue Information dialog of version 1.0 has been replaced with an Issue Editor. This provides a much richer interface for making changes to the information associated with the task and provides a mechanism for setting components and versions. The Issue Browser dialog has been enhanced to allow for background loading and canceling of long queries to JIRA. It also allows for filtering by issue type, status and priorities to speed up the process of finding the issue you need. This new feature allows updating of a group of Project tasks at one time. Now you can select a group of tasks and change all their priorities, statuses, types or assigee at one time. This feature greatly reduces the amount of time necessary to update a large number of tasks.